Shiraz is the backbone of the region, producing full bodied, rich, stylish wines with cool restrained elements. Some 70 miles north/northwest of Melbourne, Heathcote is bordered to the west by the Bendigo Region, and to the east by the Goulburn Valley Region. 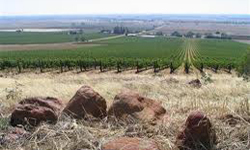 The majority of vineyards lie on the northern slopes of the Mount Camel Range (part of the Great Dividing Range) at an elevation of 500-1,000 feet with intermittent peaks of over 1,600 feet. Like the Clare Valley, Heathcote has a huge climate range with warm to hot days and cool nights. It is cooler than neighbouring Bendigo and Goulburn Valley, but warmer than Macedon to the south. The climate is tempered during the growing season by south to southeast winds and the Mount Camel Range. Annual rainfall is around 23 inches, with dry-land viticulture in the central and eastern parts of the region.